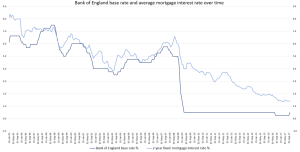 What does an interest rate rise mean for property? Today, the Bank of England’s Monetary Policy Committee announced an increase to the base rate of interest of 0.25%. This marks the first increase since December 2007, and a reaction to increasing rates of inflation, which hit 3% in September. The change marks a return to the base rate’s previous level of 0.5%, where it stood for almost 7 years, prior to its reduction to 0.25% in August 2016. What does this increase mean for the property market? Interest rates remain at an extremely low level from an historical standpoint. 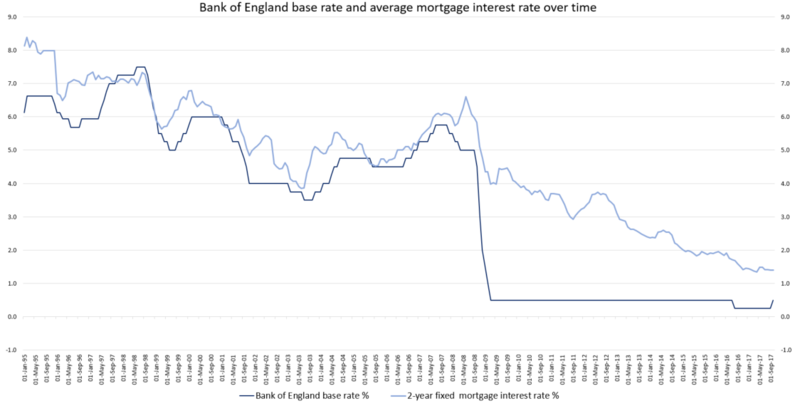 Figure 1 shows that both the Bank of England base rate and average mortgage interest rates are at, or close to, all-time lows, with homeowners having experienced higher costs of borrowing in all previous time periods. Even this simple comparison suggests a small increase in mortgage interest rates, back to a recently experienced level, will be unlikely to put undue stress on mortgage borrowers or represent a major barrier to those looking to purchase property. Indeed, in line with the positive outlook on mortgage affordability expressed by the Bank of England today, we expect the impact on borrowers, and on the housing market in general, to be minor. A 0.25% increase in the base rate is likely to result in slightly higher mortgage rates for some borrowers – but many homeowners have fixed rate deals, with a significant proportion set when the base rate was previously 0.5%. As a result, the average interest rate increase across the market is likely to be less than 0.25%, even if banks choose to pass on the base rate rise in full. To put this into context, according to the Bank of England the average mortgage interest rate currently stands at 1.4%, meaning UK households are spending an average of 12.3% of their disposable income on mortgage payments, including capital repayment and interest. This represents the most affordable period for mortgage borrowers in the past 30 years. In fact, the overall cost of purchasing a house remains in relatively affordable territory relative to the pre-financial crisis property boom, in spite of rising house prices. UK house prices are 19% higher today than their 2007 peak, while household disposable income has increased by 25% over this period. 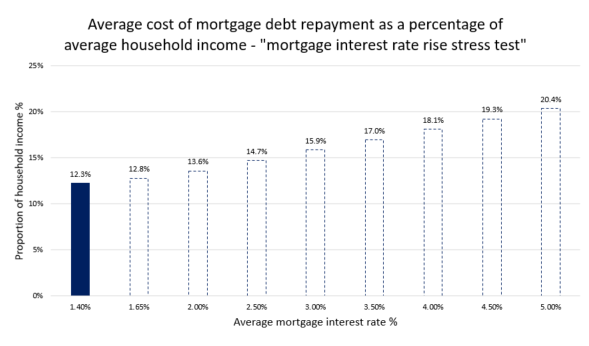 The result is a lower cost of housing relative to earnings, alongside the greatly reduced cost of mortgage borrowing. 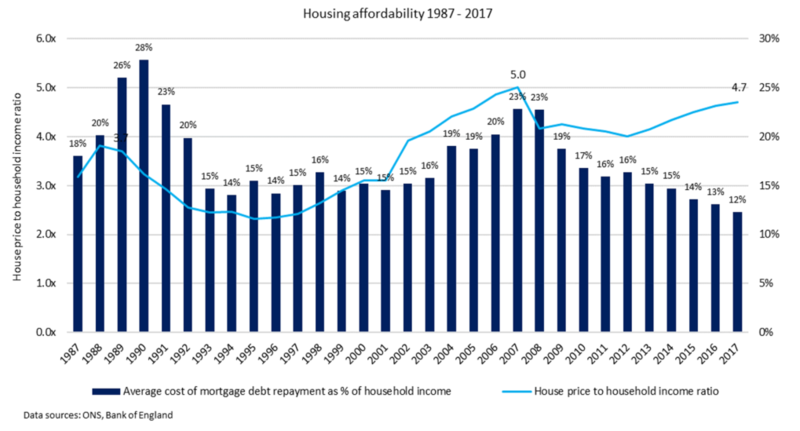 Housing affordability over time is shown in Figure 2. Figure 3 shows how mortgage payments would increase as a percentage of household income, if mortgage interest rates rise. The results indicate that the impact of today’s interest rate increase on affordability will be very small. Mortgage rates are set to remain well below 2%, similar to the average interest rate paid at the time of the base rate reduction last year. The cost of repayments could increase by around 0.5% of household income. Moreover, the Bank of England has today reiterated that interest rates will remain low for the foreseeable future, potentially with two further increases of 0.25% over the course of the next three years. In line with his previous guidance, Mark Carney suggested that rates will rise slowly towards a new equilibrium, well below the old norm where rates sat consistently at 5% or above. With this in mind, the analysis also suggest that mortgage payments will remain very affordable relative to historic levels, as the impact of further moderate increases to interest rates on affordability will not be extreme. 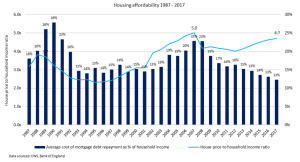 Certainly, affordability for borrowers looks set to remain in healthy territory relative to the cost of payments sustained by households during, and for some time after, the financial crisis, where average payments rose above 20% of disposable income. How does this impact the Property Partner portfolio? The monthly dividends paid to Property Partner investors (derived from each property’s monthly rental income) will not change. We use fixed rate mortgages to provide certainty in our dividend model, often over a 5-year period. Some properties have mortgages fixed for an initial 2-year term, after which the interest rate will revert to the lender’s standard variable level if we choose not to re-fix at this point. Many of these are fixed at interest rates above the lender’s current variable rate, providing a protective cushion for dividends, in the event that mortgage rates are slightly higher than now, when the two year fix comes to an end. Moreover, each of our properties is held in an individual Special Purpose Vehicle (a UK limited company). The net rental income available for distribution as a dividend is a function of the overall balance sheet of the SPV, with mortgage interest being one of a series of costs involved in the operating of the property. Thanks to the cautious approach we take when calculating our dividend targets, there is a healthy degree of insulation within each SPV. This provides for void periods, repair work and other unanticipated costs, such as a modest increase in mortgage interest.